SAINT LOUIS, May 13, 2012 -- Round six of the U.S. Championships maintained the stasis – the top three rated players still sit one, two, three with a couple of other solid players lurking. In the U.S. Women's Championship, a familiar face grabbed sole possession of the lead. GM Hikaru Nakamura traded his light-squared bishop early, but compensated by forming a wedge of center pawns to blunt GM Varuzhan Akobian's king's bishop. Opening the position for the bishop pair meant Akobian had to give back the bishop, and the resulting endgame had too symmetrical of a pawn structure to produce any winning chances. The draw continued Nakamura's pattern so far, as he has alternated winning and drawing through the first six games (he has won all three times as white and drawn all three as black). GM Gata Kamsky began the day one-half point back, but never entertained any winning prospects against longtime U.S. Championship nemesis GM Yury Shulman. The two have played in the finals in each of the past two events. Shulman won a pawn, but as the game gradually lost its life, he did not obtain a winning rook-and-pawn endgame. “The position I reached in the game, I don't have any chances,” Shulman said. Kamsky agreed with Nakamura's estimation that the winner of the tournament would need eight points. Nakamura currently has 4.5/6 and Kamsky 4/6. Besides Nakamura, the only other competitors that have yet to lose a game remain Shulman and GM Alex Lenderman. Along with GM Alex Onischuk, the trio sit in a tie for third with 3.5/6. Lenderman nearly equaled Kamsky's score as his Caro-Kann netted him an advantageous knight against a mostly impotent bishop, but the resurgent GM Alex Stripunsky held the balance. 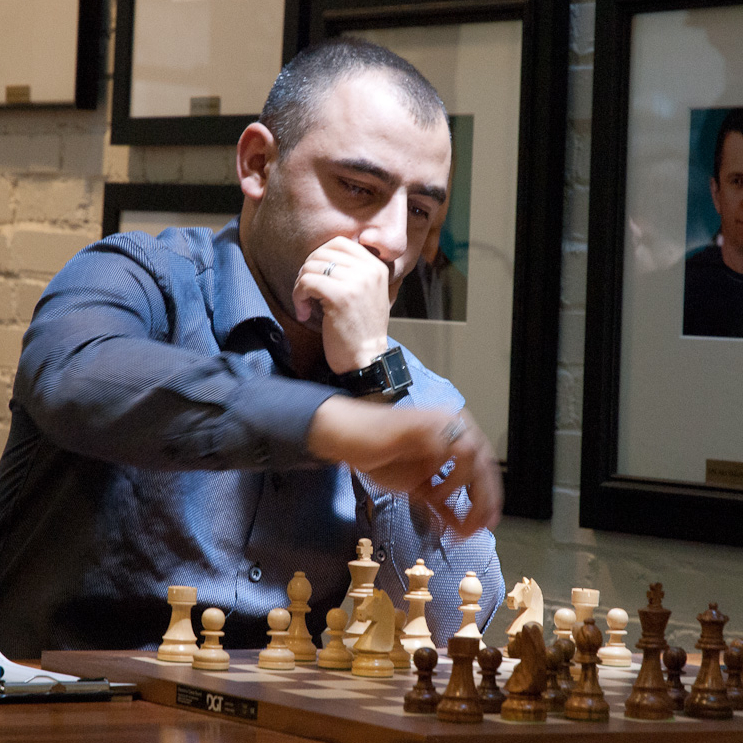 Crowd-favorite GM Gregory Kaidanov fell back to an even score with his second loss in a row. “After two long games against Gata and Hikaru, I felt very tired today,” he said about his loss against GM Robert Hess. Kaidanov was surprised by Hess's opening choice, and forced into a deviation due to a curious incident. After nine moves, his game was exactly like Onischuk's battle with GM Alejandro Ramirez. Onischuk played 10. e4, and Kaidanov felt forced to play a different line. “It would look like we are just copying each other's games,” he explained. “We try to prevent cheating in many different kinds of ways, but we can't prevent that.” He said copying another player's moves willfully is “kind of like cheating” and while not expressly prohibited, the veteran decided he needed to play a new variation. Hess found a way to trade his queen for three of Kaidanov's active minor pieces, then unearthed a nifty queen trap based on various forks and discovered attacks. In other round six action, GM Yasser Seirawan defeated GM Ray Robson to get to 2/6. The logjam in the U.S. Women's Championship is no longer, thanks to the efforts of IM Irina Krush, who bested WGM Tatev Abrahamyan today. Krush played the g3 system versus her opponent's King's Indian Defense. “It's hard to prepare for it if I've never played it before,” Krush said of her opening choice. Indeed, at the post-game press conference, a despondent Abrahamyan said she did not expect the treatment at all. The win moved Krush to 4/5 and sole possession of first. The two competitors who began the day tied with her could not keep pace. IM Anna Zatonskih could only draw WIM Viktorija Ni in a melee, while overperforming WIM Iryna Zenyuk suffered her first setback at the hands of IM Rusudan Goletiani. Zatonskih is now at 3.5/5 while Zenyuk remains at 3/5, tied with Goletiani, who has five decisive results in all five games. WGM Camilla Baginskaite got on the board with her first draw, while FM Alisa Melekhina earned her first win and an even score with the cunning simplification beginning with 51...Rxf5. Despite her overwhelming position and material advantage, IM Marc Arnold said this was the only way to convert the full point. Her opponent, WFM Alena Kats had no choice but to enter a losing king-and-pawn endgame, so she resigned. The players from both events will enjoy a rest day on Monday. Round seven for the U.S. Championship and round six for the U.S. Women's Championship begins Tuesday, May 15, at 1 p.m. Central, 2 p.m. Eastern. Tune in to www.uschesschamps.com for live commentary from WGM Jennifer Shahade and GM Ben Finegold.